The purpose of this is to give me a flavour of what types of software PM’s are operating in the world today, how they obtained their skills, and what kinds of problems they are having. I have 40 responses so far and would like to get that number up to give a bit of validity to the analysis. I’m publishing here some deeper analysis of this preliminary data to indicate the kinds of questions I’m asking myself and what I seek to tease out from the numbers. these are beyond the basic per-question summaries that you can see on Survey Monkey itself. the charts below are a little rough, TBH I’m just now getting used to the way in which Survey Monkey returns its data so they are not all that I want them to be right now. 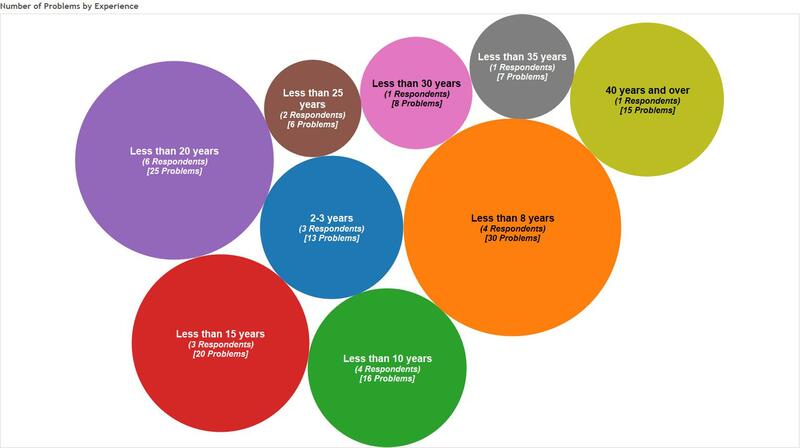 this chart shows a bubble chart of the age groupings, how many problems they selected in total and the number of respondents in each. 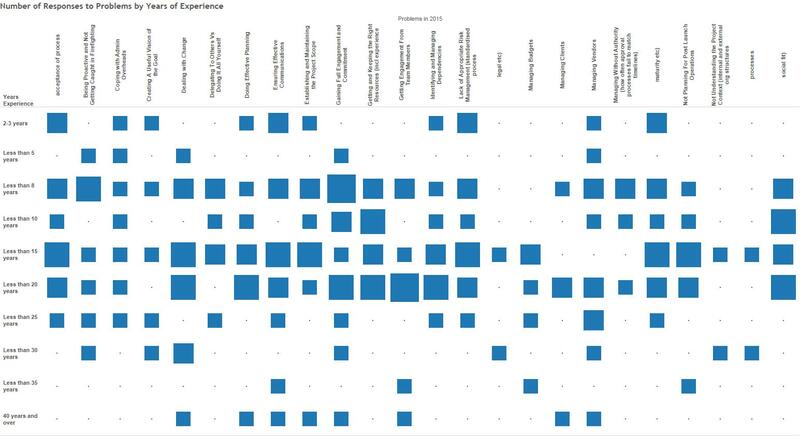 this chart shows a sort of heat map when I cross-relate the experience bands with the question on “what problems did you experience in 2015” the axes should be self-explanatory and the size of the square indicates the number of each age group selecting the respective problem. what learnings can we take out of these two charts? and if you have any PM buddies, please let them know as well. PreviousWhy do Projects Fail? Because we make them fail!